Amnesia Haze Autoflower Seeds Review. Fast to finish, producing a large central cola and multiple lateral branch buds, Amnesia Haze Autoflower seeds are quick, easy and a joy to grow. Requiring just 58 days from planting as a seedling, they can produce high quality yields of potent, 18% THC laden buds, with an average yield of 210 grams per square meter. A great choice for outdoor and beginner growers alike, these easy, simple to grow seeds are perfect for even a complete novice. If you're looking for the quickest and easiest way to produce your own delicious Haze Marijuana, these Auto seeds are the perfect choice. 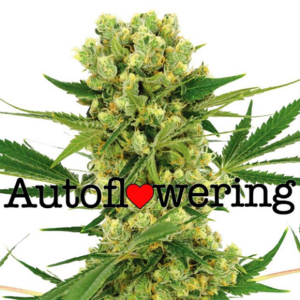 Find out more about Amnesia Haze Autoflowering Seeds. The Sativa dominant genetics produce an uplifting, energetic buzz, that's sociable and euphoric allowing the user to enjoy the high without interrupting their daily routines. A perfect day-time smoke with flavours of citrus and lemon without that lethargic, lazy feeling. Compact and fast maturing with a large central cola, and close, strong branches capable of supporting the large buds, Amnesia Haze autoflowering seeds produce good yields of powerful Cannabis quickly and easily. A great strain for beginners and more experienced growers alike, often grown outdoors during late Spring and Summer. Sativa dominant, producing a relaxing high that can have a positive effect on depression and stress, as well as easing pain, fatigue and insomnia. Read the complete Amnesia Haze Autoflower Seeds Review. Buy Amnesia Haze Autoflowering Seeds today and receive free worldwide shipping guaranteed. Seeds do not come with instructions, please follow the germination guide. If they were supplied with the seeds we may be liable to prosecution in states and countries that allow the possession of marijuana seeds, but not their germination, by appearing to condone and encourage breaking the law.